Author event with Lindsey Davis, creator of Roman detective Marcus Didius Falco, who will be joining us for an evening talk and signing event at The Collection on Wednesday 11th May at 7pm. 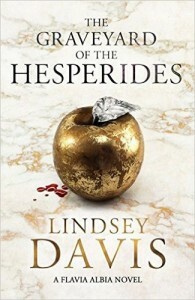 Her new book ‘The Graveyard of the Hesperides’ is the fourth in the new next generation series with Albia, Falco’s daughter, who is carrying on the family business in fine style. Tickets are £4 from ourselves and The Collection box office.